The week’s hottest temperature was 110.7 degrees Fahrenheit (43.7 degrees Celsius) at Twee Riviere, South Africa. The week’s coldest temperature was minus 58.5 degrees Fahrenheit (minus 50.3 degrees Celsius) at Dawson City, Yukon Territory, Canada. Stromboli (Eolian Islands, Italy): The volcano has returned to low to medium levels of activity. Explosions have become significantly smaller. Etna (Sicily, Italy): Etna is calm this morning, but some weak ash emissions are occurring from the New SE crater. Tolbachik (Kamchatka): The eruption continues with no change to report since yesterday. Fluid lava continues to be erupted from the vent on the southern fissure and feeds lava flows. Sakurajima (Kyushu): The volcano has been very productive lately. There have been several relatively large explosions over the past days, producing ash plumes rising to 10,000 ft (3 km) altitude. Taal (Luzon, Philippines): 8 more small earthquakes were registered during the past 2 days. Other monitored parameters show no alarming signs that would suggest an eruption in the near future. Popocatépetl (Central Mexico): (31 Jan) Glow remains brightly visible at night. The rate of weak steam/gas/ash emissions was about 1 per hour since yesterday. Santa María / Santiaguito (Guatemala): (31 Jan) Activity was low today. Only some small explosions and few small to moderately sized avalanches from the active flows were reported. Fuego (Guatemala): (31 Jan) Both explosive and effusive activity have been low today. Only 4 weak explosions with ash plumes rising about 300 m were counted, and the lava flow was only 150 m long this morning. Arenal (Costa Rica): (31 Jan) The volcano had shown some increased seismicity at the end of December, but has calmed down again. Copahue (Chile/Argentina border): (31 Jan) SERNAGEOMIN reported a decrease in seismic activity. No new surface activity was noted, but the alert level remains at orange. Heard (Australia, Southern Indian Ocean): (31 Jan) A thermal hot spot remains visible at the summit crater on MODIS satellite data, suggesting that some activity continues there. Far East Russia’s Plosky Tolbachik volcano spewed jets of hot lava up to 650 feet above the Kamchatka Peninsula’s frozen wintertime landscape. The volcano roared back to life in November after lying dormant for almost 40 years. Russia’s Kamchatka Volcanic Eruption Response Team said the eruption has created four new cinder cones on the flanks of the mountain. Lava is also reported flowing down its western and southeastern flanks. Vulcanologists say the eruption may be creating the first lava lake ever recorded on the Kamchatka Peninsula. This means the flow from deep beneath the surface is fast enough to keep all the lava fluid enough to form a lake. The Ministry of Health of the Kingdom of Cambodia reported five new human cases of avian influenza that were confirmed positive for the H5N1 virus in January 2013. Landslide in Yunnan, China destroyed 35 houses completely. The landslide also damaged 928 houses in Zhenxiong county. The landslide displaced 712 people in Zhongtun township. However no fatality was reported. At least 7 people injured in Mbanza Congo floods. The floods in Northern Zaire Province of Congo also made 1,386 families homeless. More than 200 houses have been flooded. Flooding in Zamboanga del Norte, Philippines has affected nearly 10,000 people. The evacuated people have been living in nearby schools or moved to higher ground. Floods have also affected people of Dipolog City, Polanco and Katipunan. As of 12:00 UTC, TC Felleng was located 275 nm west of La Reunion. Tropical Cyclone Felleng caused heavy rainfall in Madagascar, Reunion and Mauritius. In Madagascar five people were killed yesterday. Floods displaced more than 700 people in Antananarivo. 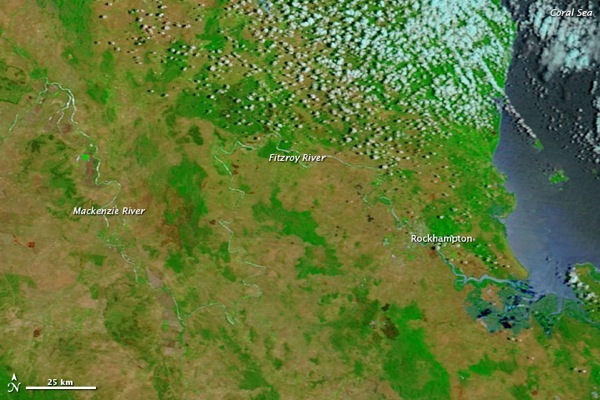 These satellite pictures show the extent of the Australian floods near Rockhampton – before and after Tropical Cyclone Oswald brought the deluge. 6.3 and 5.1 Earthquakes hit the Santa Cruz Islands. 5.7 Earthquake hits eastern New Guinea, Papua New Guinea. The Australian government has pledged to stop coal port or shipping developments that would cause damage to the Great Barrier Reef as it responded to a Friday deadline amid U.N. warnings that the reef’s conservation status could be downgraded. UNESCO warned last June that the World Heritage Site could be listed as “in danger” if there was no evidence of progress by Feb. 1 on protecting the reef from threats that also include climate change and the predatory crown-of-thorns starfish, which is wearing away the world’s largest living structure. Heralded as one of the seven natural wonders of the world, the 2,000 km (1,200 mile) Great Barrier Reef is home to 400 types of coral, 240 species of birds and 1,500 species of fish. It is worth A$6 billion a year in tourism to the local economy. But coal is one of Australia’s top export earners and the state of Queensland is the country’s largest coal producer. The reef faces growing threats from shipping driven by coal project expansions. UNESCO, which gave the reef World Heritage status in 1991, made a number of proposals to the national and Queensland state governments on managing the reef, such as halting further port construction and limiting ship numbers. At least 18 cholera cases have recently been confirmed in Ntoroko district following massive displacement of residents by floods. A large bushfire is burning out of control in Victoria’s Mount Hotham area after leaping containment lines. Hailstorm killed at least 9 people in Chevella, Moinabad and Shankarpally area of India. Hailstorm also damaged several houses and crops across Andhra Pradesh. As of 12:00 UTC, TC Felleng was located 300 nm west-northwest of La Reunion. Shock is turning to anger across Queensland’s flood-ravaged communities as authorities struggle to meet the needs of tens of thousands disaster victims. Heated scenes unfolded in devastated Bundaberg after police overruled a council plan to let residents back into the city’s north to see what’s left of their homes. Residents reacted furiously despite being told it was for their own safety. Water police have been tasked with guarding the Burnett River in case locals attempt to cross over by boat. Police were stationed at the council chambers after residents were told they would remain locked out of the disaster zone. Police said there was simply no choice, with safety inspections still not complete. But it’s hoped residents may start returning from 6am (AEST) Saturday. “It’s a scene of utter devastation. Houses are not there anymore. There’s roads that are not there anymore.” Dead cats and dogs litter the streets, houses have been washed from their foundations and one home is missing entirely with no clue to its final resting place. 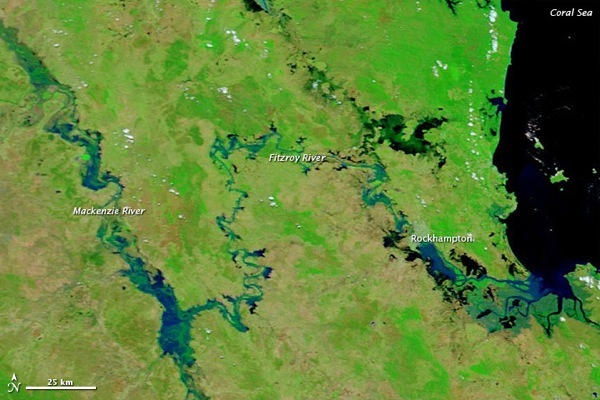 The devastation caused by ex-tropical cyclone Oswald continues to grow. The army finally arrived in the town of Munduberra, west of Gayndah, on Friday morning – four days after flood levels there peaked, flooding 100 homes and businesses in the town and the same number in outlying areas. In North Burnett, many homes had been flooded to their roofs, and a couple of houses had been split in half and partly washed away by the force of the water. Local people, many of whom were elderly, were worn out after having been hit by floods only two years ago. They’d quietly hoped for immediate help, but it didn’t come. The damage bill from the disaster is certain to climb into the billions, with infrastructure smashed, farms ruined, and so many homes and businesses across the state damaged or destroyed. An early estimate of farming losses alone has been put at $100 million. The Queensland Farmers’ Federation says everyone from pig and dairy farmers to sugarcane and citrus growers urgently need access to the highest levels of disaster assistance. Still in Australia – Damaging Storms hit Sydney. Severe thunderstorms have rolled across parts of Sydney, cutting power and disrupting train services, while hailstones have pummelled the Blue Mountains. The U.N. reports that heavy rains in northern and central Mozambique on Thursday have displaced 19,000 more people, raising the total number of displaced by floods the past two weeks to nearly 170,000. 6.8 Earthquake hits Atacama, Chile. The earthquake shook offices, toppled supermarket shelves and broke windows on Wednesday in north-central Chile, where people fled some buildings in panic. However, no serious damage was reported. 6.2, 6.0, 5.6, 5.6, 5.4, 5.1, 5.0, 4.9 Earthquakes hit the Santa Cruz Islands. 6.0 Earthquake hits south eastern Alaska. Stromboli (Eolian Islands, Italy): Activity has generally decreased over the past days, with less tremor and weaker explosion signals. Today, tremor seems to be stronger again. Etna (Sicily, Italy): Vigorous eruptive activity has started at the Bocca Nuova crater and produced a short phase of violent strombolian activity. Santorini (Cyclades, Greece): According to the latest seismic and satellite data, the uplift at the Santorini volcano (2011-2012) has has come to an end. Tjörnes Fracture Zone (North of Iceland): Earthquakes continue with typically 10-20 quakes recorded in the TFZ. The swarm that had started 20 Oct last year has now been going on for over 3 months and shows no signs of stopping. Tolbachik (Kamchatka): (30 Jan) The eruption continues unchanged. Taal (Luzon, Philippines): Elevated seismic activity continues. During yesterday-today, PHILVOLCS detected 13 volcanic earthquakes. Two of these events, which occurred at 7:03 and 7:04 PM yesterday, were felt at intensity II and accompanied by rumbling sound as reported by residents of Barangay Calauit located at the southeast sector of the volcano island. Tongariro (North Island, New Zealand): Some small earthquakes have appeared again today, but generally, seismic activity has been showing a decreasing trend over the past weeks. White Island (New Zealand): (30 Jan) Activity remains elevated and fluctuates between stronger and weaker phases. In its latest bulletin, GNS reports that the hot lake has dried out and a small tuff cone has started to form on the former floor of the lake: The active vent continues to produce vigorous bursts of mud, rock, steam and gas from 50-100 m high. Ash is not being carried into the plume. This activity is intermittent as is the seismic activity. Current activity is not sufficient for Volcanic Alert Level 2. Santa María / Santiaguito (Guatemala): Activity today remained low. Only few and very weak explosions and small block avalanches from the active flows were reported by INSIVUMEH. Fuego (Guatemala): Explosions have been becoming more frequent (now 12 during the past day vs a previous average of only 5). They produce light gray ash plumes drifting south and SE for about 5 km. The lava flow is still weakly active, but was only 150 m long this morning. San Cristobal (Nicaragua): (30 Jan) Numerous tiny volcanic earthquakes and weak volcanic tremor reflect internal unrest. Masaya (Nicaragua): (30 Jan) Seismic activity remains at more or less stable levels, showing normal background activity of continuous internal fluid movements. Copahue (Chile/Argentina border): (30 Jan) Seismic and degassing activity is on the increase, Sernageomin reported in its latest bulletin (29 Jan). During 28-29 Jan, a total of 345 volcanic earthquakes (plus more than 400 not counted ones because below threshold) and 6 hours of volcanic tremor were recorded. The seismic swarm was accompanied by an increase in the degassing activity, creating a column of 500 m during pulses of more intense activity. No glow or ash emissions were seen. Heavy rains and gale force winds pelt northeastern Madagascar as strengthening TC Felleng barrelled toward the island’s east coast. Winds were around 175 kilometres an hour. Cyclone Felleng has become the strongest cyclone of the South Indian 2012-2013 storm season. Heavy storms across south and central U.S.
Storm in Nashville, Tennessee has killed one person. Tornado in Mount Juliet, Nashville damaged the top floor of a three-story building. Lightning injured a person in Monticello, Arkansas. Storm damaged more than 20 homes in eastern Greene County in Indiana. Tornado also damaged houses in Elkins and Goshen in Washington and Berryville in Carroll County. The National Weather Service is currently investigating reports of at least four more tornadoes in Arkansas and Mississippi. 5.4 Earthquake hits the Philippine Islands region. 5.3 Earthquake hits the Xizang-Qinghai border, China. 5.1 Earthquake hits the Santa Crux Islands. Large wildfires are burning through South Africa’s winelands, prompting authorities to declare a code red emergency and dispatch over 200 firefighters to overwhelmed areas. More than 7 200 hectares of fynbos were burned.